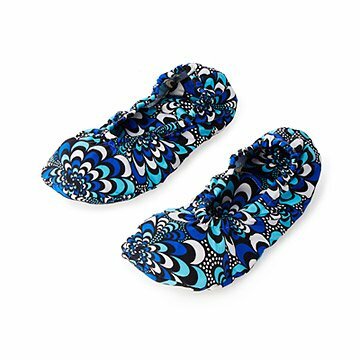 These travel slippers have a microwaveable insole that releases warmth and a soothing scent. Standing in line at the airport. Security check. Carry on luggage. By the time you reach your hotel, your feet are ready for a vacation. Good thing you brought your magic slippers. You don't need to click your heels together—just pop the insoles into the microwave for 30 seconds, slip them on, and feel the tension melting, melting. The secret is that the insoles are filled with dried lavender and comfy seeds, which release a steady warmth and a soothing scent that'll make you feel like home even when you're on the road. Made in Argentina. My daughter was mad at me, and she has loved me ever since i gave her this gift!